We’ve created a Micro Market template you can use to close accounts. 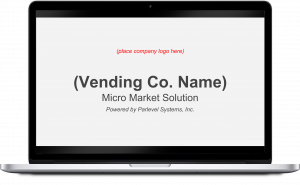 Input your company name, logo, and more to make the presentation truly your own. Show locations why they need a Micro Market from you. 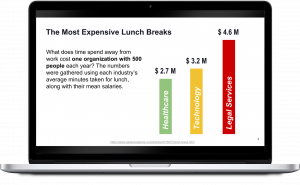 This presentation is loaded with stats that show potential accounts exactly how your Micro Markets can make their businesses better. Use the presentation to explain in detail exactly how the Micro Market concept works. The location will know what you can offer them, and how you’ll do it. Wrap the presentation up with a call to action. Arrange next steps, set up a meeting, and close the account. By pitching with this presentation, you’re well on your way to securing accounts that will make your business boom. 2. Select “File” on the top left, select “Download As”, and then select “Microsoft PowerPoint”. 3. Open the PowerPoint file, then simply add your company information and logo. 4. 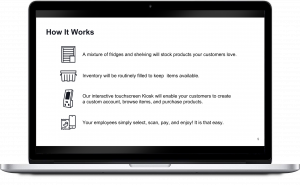 Successfully pitch to locations and close profitable accounts!